Physical Geology: Earth Revealed is appropriate for introductory physical geology classes. 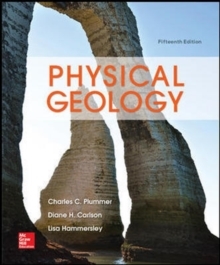 This text, which includes the same information as the market-leading Physical Geology - 13th edition, by Plummer/Carlson, is for the instructor who prefers to cover plate tectonics early in the course. The ninth edition has been updated to include the most current information from the various sub-disciplines that comprise physical geology. The book's purpose is to clearly present geologic processes so that students can understand the logic of scientific methods. This text features an outstanding art program and a proven, accessible writing style.